A little on British scribe rule. In summary, a traditional timber framed structure uses just timber for the entire construction. This is made possible with a combination of various mortice and tenon, scarf and lap joints, fixed with hand made pegs. No metal nails, brackets or fixings are required. Traditional timber frame carpentry has been around in Britain for many hundreds of years, but the craft was lost to time. It has recently undergone a revival led by carpentry and history enthusiasts. A few of these early adopters started the Carpenters Fellowship. 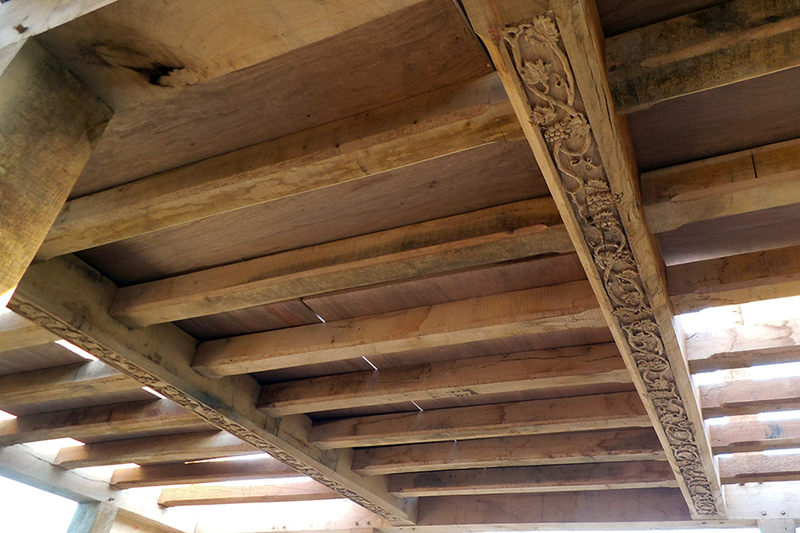 By piecing together evidence left on the historic timbers of the still standing quality timber frames, these early adopters were able to re-create the techniques used many hundreds of years ago. This technique is known in Britain as ‘scribe rule’, of which there are many derivatives. The scribe rule technique allows modern timber framers to accommodate for the irregularities that exist within large timbers; twists, tapers, bends and waney edges can all be accounted for to get nice tight joinery. The key to a good quality timber frame is joints that have no gaps. We use traditional draw pegged mortice and tenon joints for all our timber frames, which are typically in green oak. There are many companies (mostly lurking on that online auction website) that are producing frames more cost effectively by short-cutting these full scribe techniques. Some even use huge soul destroying joinery machines 🙁 . By cutting standard length timbers to patterns and eradicating the irregularities (and charm) from the timber they are able to produce lesser quality frames very quickly. We do not do this. By adopting ancient techniques we are able to produce highly complex multi-storey buildings that are accurate to a few millimetres of the architects drawings. We also feel that by maintaining a specialist focus on the timber frame alone, we can provide a much refined product as our skills are not being diluted in other areas. Though the craft was born from the medieval period, we like to be creative, adapt and improve the craft into the 21st century.